I never like to think of the worst happening, as I’m sure we all don’t – but the fact is that sometimes it does, and we should always be prepared for it. 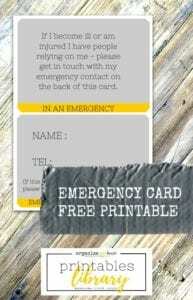 I wanted to share an emergency card idea (and enhance it more) that I found recently, all about how to get help to others that rely on you should you be taken ill while out and about. Over the summer, I shared a picture on Facebook that sparked a great discussion, and it centred around how to get help to your pet should you ever be taken ill or have an accident when you are out of the house. 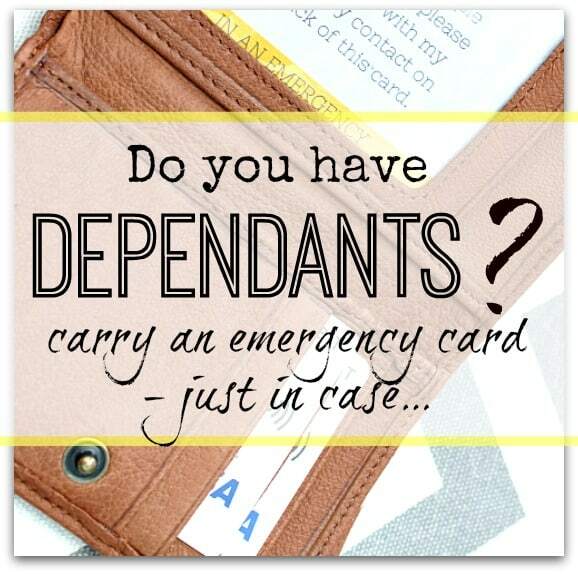 The basic idea was to carry around in your purse, along with your usual ID, a card saying that you have a pet at home relying on you – and to have a number of a friend/family member to call if you are unable to make the call yourself. Unfortunately I can’t find that article now, but have found a similar site showing this idea off HERE. I’ve also found a link where you can print one off yourself and fill in. This is a fantastic idea as having a pet at home alone with no-one knowing would be terrible. I’m sure you can think of loads of circumstances where you have people depending on you, or a home that would need to be looked after etc…. 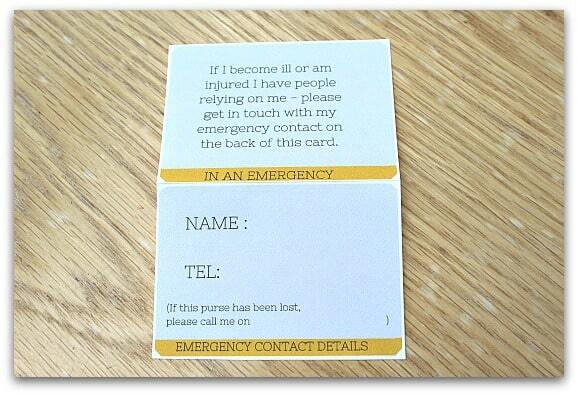 If I become ill or am injured I have people relying on me – please get in touch with my emergency contact on the back of this card. If lost, please call me on …………………. 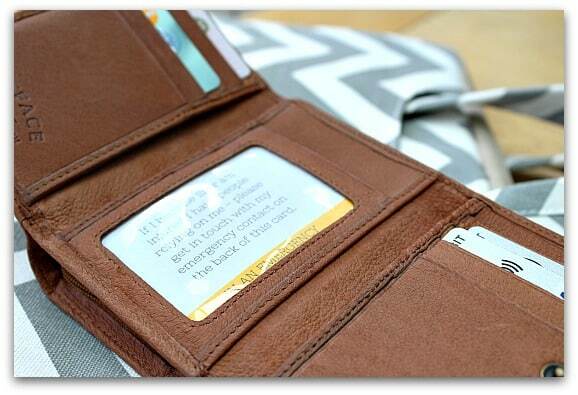 NOTE – Be careful about what information you have in your purse i.e. addresses etc… – nowadays our driving license has our address on it so you probably have this information in your purse already, but I would always suggest caution and simply leave a name and number to contact so that it keeps it fairly anonymous. I don’t know, but when I lost my purse a few months ago, maybe having this in it would have enabled someone to get in touch and get it back to me, and I know that I would feel better if I had set this up should I not be able to get to school to pick my daughter up. Once you have created your own card, or printed off the one above, you need to ensure that whoever you put as your contact is someone who can help out, and someone who is aware of the fact you have put them down as your chosen contact. They need to be happy with the fact that you have their name and number on the card, and that they could help in an emergency. Think about adding their name to a list of people able to pick up your child from school (and let your child know), ensure they have keys to your home and details of what to do i.e. alarm code, what and how to feed any animals, who else to contact for you etc…. 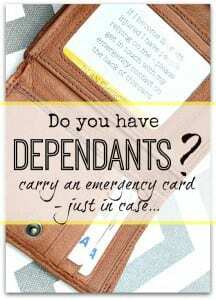 Basically, this may seem like overkill, and most of the time any emergency preparedness that you do will seem that way – but it will be a life saver should the worst happen. Do you think this is a good idea? Do you have something set up already like this? I’d love to know your thoughts so please leave a comment below….